It hadn't rained during the night, a good thing, considering I was sleeping out in the open. Four of us were camped at Badger Flat in the Inyo Mtns for a few days of peakbagging with a forecast looking increasingly ominous for our last day when we planned a climb of Winnedumah Paiute Monument. Before starting out we paid a last visit to the summit of Mazourka Peak so we could get some sunrise photos. Cloud cover provided some visually appealing scenes, but perhaps a little too heavy as they were fleeting, lasting no more than a few minutes. Laura decided not join us for the climb to Winnedumah, preferring to hang out and read a book back at the main road where we left two vehicles while three of us piled into the Jeep for a ride to the 5,900-foot informal TH at the Wilderness boundary. We had some trouble locating it because the side road we were to hike up wasn't signed nor obvious while driving along, but thanks to the waypoint marked in the GPSr, we found it with only a short bit of backtracking. We followed directions provided by Summitpost, a few miles shorter than those provided by Zdon's Desert Summits, though the 2-mile Jeep ride could not have been done by an ordinary vehicle due to steepness and at least one narrow spot where the road is washing out (the main Mazourka Canyon Rd is navigable by any vehicle, at least to the turnoff 12mi from Independence). From our parking spot, we hiked a little less than 2mi north on an old mining road now inside the Wilderness boundary. A sandy, flat wash area was reached when just north of due west of the monument, indicating the start of the cross-country effort. This was followed by another two miles going in and out of several drainages while maintaining a general upward trend, gaining another 1,000ft after a first 1,000ft of gained along the old road. We looked for ducks and use trails, finding a few of the former but none of the latter, leaving us to find our own way like those before us. The monument is not visible for the first half hour after leaving the road and though I had the route dialed into the GPSr, I let Tom take on the navigational duties via dead reckoning. He did a remarkably good job of it too. He apologized for leading us into a first boulder garden followed by another half an hour later, but they avoided some brushy sections and frankly I couldn't have done a better job myself. All the while we were on the hike the cloud cover continued to grow thicker, eventually blotting out what blue sky remained and warning us with a few drops as we approached the monument. Upon reaching the crest we could see rain falling to the southeast and moving in our direction. Time was not on our side. 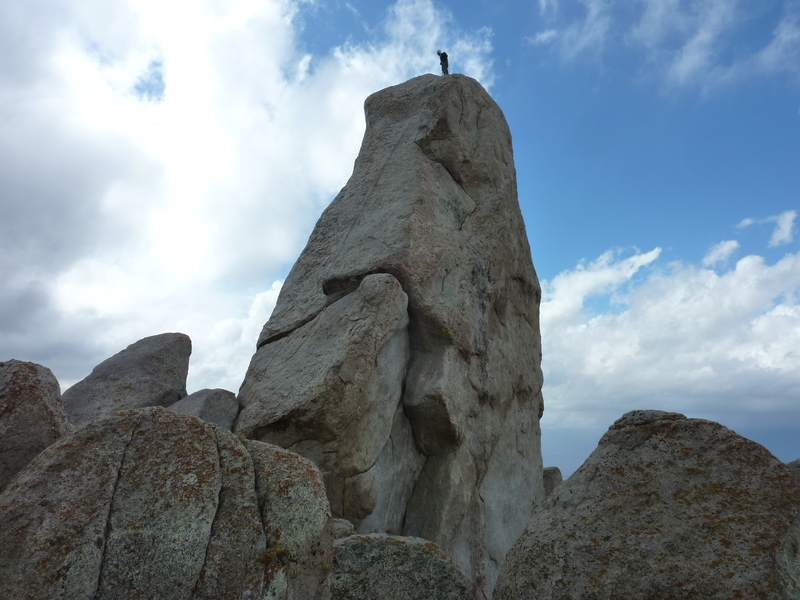 We unloaded our packs on the east side of the 70-foot granite monolith which offered the only reasonable route up. The original plan called for Tom to do the lead duties but that was shifting as he offered it over to Matthew as we were changing into rock shoes, putting on harnesses and other sundry tasks. Sensing a lot of hesitation and being the first ready, I made the executive decision to do the lead myself and headed up the lower blocks while one of the others tied in to belay me. This had several advantages, not the least that I would probably lead it faster since I don't like placing protection. It was the first time in memory I was rock climbing with a rain jacket. There are two bolts on the lower half of the route and just as I was about to clip into the first one, the rain started in earnest. Luckily there is little lichen on the route and the rock held traction despite being wet. There were other problems though, including the water running down my face and making it hard to see. I struggled with the second bolt, clipping that one eventually as my fingers started to grow numb despite the leather gloves I was wearing. The wind grew stronger as the thunderstorm cell intensified and where saner reasoning would have told me to retreat, I stubbornly continued up, convincing myself that it would be easier to rap from the top than try to downclimb in the rain. I don't recall if I placed a cam in the small crack higher up but I recall pausing here while I tried to find a good foot placement before making the final stretch up to the top, my calf strength starting to fail. Just as I topped out there was a huge BOOM off to the side, the first (and only, it turns out) crack of thunder from the overhead storm. I missed the flash of lightning but I knew this was a seriously exposed spot and needed to get down as quickly as possible. The summit bolts and chains were set up for rap off the west side which we couldn't afford (it takes two ropes to make it off that side) so I hurriedly set up a rap off the east side with the help of a sling and three carabiners (this could have been minimized considerably and saved me some gear if I'd time to reflect on it properly), pulled up the rope, tossed it back down after equalizing, and got off the blade of rock before the next stroke of lightning could make a shish kebab of me. When I was back down at the bottom, the first thing I did was dig out more clothes while we huddled under an overhang to avoid the heaviest parts of the downpour. Things started to improve a few minutes later as the rain let up and some blue sky reappeared. Tom and Matthew were discouraged initially, thinking I might be the only one to make it to the summit, but I suggested they should not give up so easily - and besides, it would be easier to climb with a toprope now than it had been on lead. Tom continued to have doubts about the wisdom to give it a try until Matthew said he was willing to give it a go. I pressed Tom to act as belayer because my hands were still numb, though not so frozen that I couldn't operate the camera. Once in position, Matthew took about ten minutes for the climb while I bounced around to various spots on the crest to capture it from different angles. Tom was even faster when it was his turn, the rock having dried some by then, though the blue sky had disappeared and the weather was once again threatening. It was around 11:30a by the time we were done and packed up, having taken about an hour and a half for the rock climbing portion. Others have rated it around 5.3-5.5 which seemed fair, even with the inclement conditions. We wasted no time starting back down, knowing our luck could run out at any time. Our track on the return was a little more northerly, avoiding the rock gardens and seemed to be less brushy. The rain held off until we had returned to the road and then came down in earnest for the last two miles back to the Jeep. Our pants and and boots were thoroughly soaked by this time, our upper bodies fairing a little better thanks to the rain jackets, but it had come down so hard that it got in around the neck and arm opening and we were pretty damp underneath before we were done. The road and washes had begun to flow with more water than I'd ever seen in the desert before and the drive back had its own excitement, often driving in small rivers cascading down the roadway with us. Laura had a big grin on her face when she saw the three of us pull up, looking like wet dogs - "Boy, I made the right call on this one!" she mused.